Therapy Opening Line: As the thirtieth minute ticked by, he knew he would never see his daughter again. 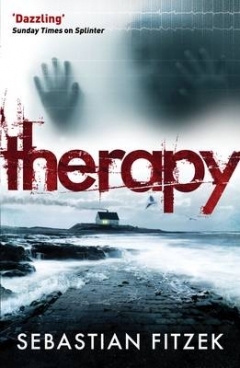 Therapy is about Psychiatrist Viktor Larenz and the disappearance of his daughter, Josy. The novel is brilliantly translated by Sally-Ann Spencer but even the translation did not make the book enjoyable. I do not particularly enjoy books where the time line is muddled. And the end of this book is such a let down, that it did not make a good story great. No witnesses. Twelve-year-old Josy has an inexplicable illness. She vanishes without a trace from her doctor’s office during treatment. Four years later, Josy’s father, psychiatrist Viktor Larenz, has withdrawn himself to an isolated North Sea island in order to deal with the tragedy. No body. Then he’s paid a surprise visit by a beautiful stranger. Anna Glass is a novelist who suffers from an unusual form of schizophrenia: all the characters she creates for her books become real to her. In her last novel she has written about a young girl with an unknown illness who has disappeared without a trace. Where is his daughter? Can Anna’s delusions describe Josy’s last days? Reluctantly, Viktor agrees to take on her therapy in a final attempt to uncover the truth behind his daughter’s disappearance. But very soon these sessions take a dramatic turn as the past is dragged back into the light – with terrifying consequences. It offered light and easy reading but this is not a book I would recommend. I am only grateful that I did not pay for the book! A bad ending is the worst, a shame this book was not great!